﻿	Woman in the Middle » Happy Easter! Wishing you and yours a wonderful Easter! I hope spring has sprung where ever you are, unless you live in the southern hemisphere, and then I hope you are having wonderful fall weather! Happy Easter to you too! BTW: What do those words say under your picture of flowers? I figure it says, “Happy Easter”, but what country and time is it from? 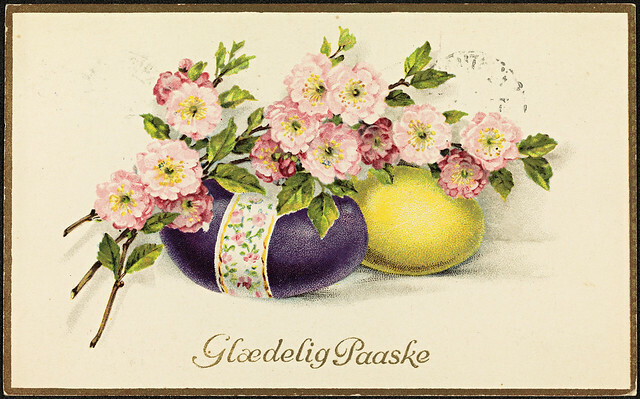 I think it says Happy Easter in Danish. I assume it is from the early part of the 20th century but Flickr didn’t say.